Submitted by webmaster on Thu, 02/06/2011 - 14:03. 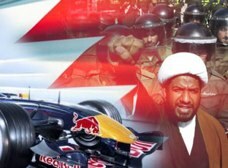 This Friday, the brutal rulers of Bahrain might win hosting rights for the prestigious Formula 1 Grand Prix. But many drivers are uneasy about racing in a country that has tortured nurses, students, and innocent protestors. Let's call on Red Bull -- the leading team -- and its rivals to boycott Bahrain unless the violence stops! Red Bull has built a reputation as a sporty, fun drink -- but by this Friday, it and other leading F1 teams may become better known for endorsing government torture and murder. Formula One has 24 hours to decide whether to hold its already-delayed race in Bahrain, site of one of the most brutal crackdowns in the Middle East. If Red Bull refuses to race in Bahrain, other teams will pull back as well -- and the Formula One race could be taken off the schedule, sending shock waves through Bahrain's brutal government and sending an unmistakeable message that the world will not ignore state brutality. Sports boycotts have piled pressure on other regimes such as apartheid South Africa -- we can do it again. The Bahraini government has booted out the world's media -- even torturing a female journalist working for a French TV channel. Under cover of this blackout it is claiming that all is calm and orderly. That's a blatant lie. Early one morning last week teargas bombs were shot through a window of a leading human rights activist. He only just rescued his brother, wife and daughter, who were close to suffocation. He now appeals to Avaaz “to do whatever you can to stop the government from attacking me and my family". Bahrain has even sacked and abused a quarter of the workers at its F1 race track. One badly bruised track worker says that a policeman “put my head between his legs, flipped me on to the floor – and then the beatings really began”. Many people are still missing -- such as a student who was injured during attack on university of Bahrain. Doctors, journalists and others have given harrowing accounts of torture and abuse at the hands of the police. The sports we play and watch can uplift us, but can also be used as pawns in political games. Together we can show that people standing for human rights everywhere, trump money and brutality anywhere.